Last week was a real treat at the Wilderness Certification Program. Hawkeye came on Wednesday with bobcat skulls, deer antlers, and some great stories. Storytelling, we learned, was an important part of native cultures. Stories were told to pass the time between sunset and going to sleep. Different stories of personal adventures and folklore entertained both young and old, and brought a lot of laughter and excitement into the lives of the indigenous people. Good storytellers use a lot of body language, different tones and voices, and look into the eyes of their audience. I know I heard some great stories, including Ned and Fred (awesome, Dixie!) and the Chimpanzee let loose at Woodstock (thanks Fritz). On Thursday, Karen Sherwood from Earthwalk Northwest came out and taught us how to twist up cord out of different natural materials. Types of materials included rootlets, bark, bast fibers, and even leaf fibers. This is some cord made from stinging nettle fibers. The technique I used here is the reverse wrap. Other techniques include the thigh spin, three strand wrap, and double reverse wrap. This is about twenty feet of nettle cord, reverse wrapped. It took me about three hours to make twenty feet. With the thigh spin method this would take about three minutes. The sacrifice of using the thigh spin, however, is the strength and tightness of the cord. It's a game of give and take. Friday was a blast. We paid a visit to Hawkeye's school, Quiet Heart. We met students in the Outdoor Wilderness Living Education (OWLE) program. They ranged from age 8 to 11 and blew all of us away. They were chopping wood, starting campfires, and making knives out of stones, sticks, and bark fibers. A few of the older kids even gutted some mackerel with their stone knives! We went on a nature walk and Nate (9 years old) pointed out Black Capped Chickadees and an American Dipper. He also told me all about the Cedar tree and its importance to the native people in this region. At the end of the day, we played a game called Foxtail, which doesn't end. Hawkeye called it a burnout game, and I was thinking to myself, "the kids will get eventually get tired and we will end the game." This was not the case, as each of us "older kids" dropped out, one by one, huffing and puffing with our arms over our heads. These kids absolutely amazed me with their knowledge, respect, and focus on the tasks at hand. Field Trip to Central Washington! A view of the Columbia River from Potholes Campground at night. Everyone huddled around the fire carving materials for hand drills. Steve making a coal with his new kit; note his excellent form. Fritz and Jason taking a break from hand drilling to admire the moon. The skull of a young buck we found at the site of a cougar kill. All in all it was an incredible trip, with lots of awareness games around the fire, many gifts from mother nature, and more bonding and friendship amongst the Alderleaf students. The twining was done with sweetgrass (rush) and functions to keep the bark taught. The dark strip seen is of cherry bark interwoven, and it not only adds to the aesthetics of the basket but makes it easy to find if you set it down out in the woods. On Thursday Karen taught us how to make our own medicine in the form of tinctures. This is relatively easy and anyone who is looking to be their own doctor (for minor ailments only!) can benefit from making tinctures. We gathered cedar leaves and devils club roots, wiped them down, put them in a jar, and filled it with strong vodka (100 proof). Alcohol draws out the medicinal properties of plants over time. The only steps to follow after that are: shake the jar at least once a day, and bottle the tincture any time after one full moon cycle (28 days). The photo above showa tinctures made of Oregon Grape root (thanks Jason and last year's class) and Angelica seed. Oregon grape stimulates liver functions and skin metabolism. It is also an anti-microbial for the skin and digestive tract. Angelica seed tincture is soothing to the cramped or upset stomach, and can help suppress excessive vomiting. On Friday, Adam Rawson came out again to discuss mapping, triangulation, and windbreak on properties. We learned, upon observing pooling water in the middle of our barn, that drainage is the issue of importance in the Pacific Northwest. This is different than most of the world, which needs to concentrate highly on water storage because importing exotic water creates air pollution and may contribute to global warming. After Friday, and seeing all the pooling water on the property, I have had numerous thoughts on how to store all of this rainwater and make it usable to us throughout the dry months. Using the natural slope of the property, we can channel all of the rainwater into basins, ponds, or tanks that will store our water. If we want to make this water potable for our consumption, lining the tanks with limestone or marble will clean the water (these wonderful stones remove acids, metals, and salts from our water, making it alkaline and ready for drinking and washing). We built a group shelter last week at the Wilderness Certification Program. 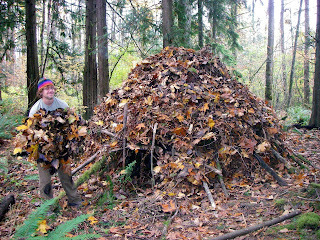 The type of shelter we built is called a debris-tipi. This is a tipi made of debris. Five of us began work on this shelter on Thursday at around 10 am. We worked consistently until sundown. The skeleton for a debris tipi consists of two circles of standing sticks about three feet high and about 10 ridge poles all coming to a point above the center of the stick circles. The skeleton didn't take too long to build, but we checked its strength over and over again because the last thing anybody wants is their home collapsing on top of them. We placed some lattice work of smaller sticks and fallen boughs from conifers in the area perpendicular to the ridge poles. The lattice work was to catch most of the debris we were to put on after lunch. Five hours straight of gathering dead leaves and small sticks from the ground and throwing them on top of the skeleton gave us the bare minimum insulation to get us through the night. We left a spot for the door that was about 18 inches high by 14 inches wide, just enough to crawl through. Our bedding consisted, from the ground up, of hemlock boughs, sword ferns, and numerous layers of the driest moss we could find. The bedding surrounded the fire, which we started by friction. I made the coal outside and passed it into Jason, who blew it into flame and added kindling. All the while T'Jen was serenading the fire into existence. As we crawled into the shelter we noticed a gap above the door. We closed it off and saw that we had just made a firewood rack. We didn't have to crawl out for wood all night. The fire was to be tended, in two hour shifts, by each one of us. At one point the fire got so big that part of Jase's goatee was cinged from his face. On Friday morning we saw that the wind had done some small damage to our tipi. If one were to stay in a shelter like this for more than one night, daily patchwork would need to be done. We evaluated some of the habitats near the river and finished the day early. On Wednesday we saw some great tracks of deer, beaver, heron, sandpiper, killdeer, cottontail, muskrat, snipe, and raccoon. We analyzed the gaits (how animals move) of a few critters. One of the trails we saw was that of a deer. It was walking all wacky with two feet facing forward and the other two facing almost perpendicular. One of the sideways footprints didn't register as heavily as the others, leading us to the conclusion that this deer was hurt. We weren't far from the road, so it may have been hit by a car, but I like to imagine it getting attacked by a coyote, scuffling a bit, and limping away after showing the coyote just how tough it was. The tracks of a pacific jumping mouse. Jason working on the outer walls of our debris tipi. Steve putting our ridge poles in place. Drying out and warming up the inside with a toasty fire. Our new greenhouse structure; Alderdleaf is beginning to look like a farm! Some sideways lettuce sprouts, 3 weeks after planting. An example of some crude obsidian knife making. A hand print in the mud after our epic mud fight.